The Apple iPhone 5S might be the smartphone incumbent but with HTC unveiling its new HTC One M8 - the update to last year's telephonic behemoth - which is right for you? 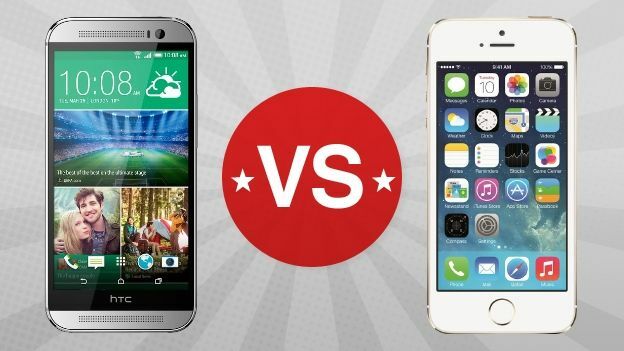 To get the full picture of just how good the HTC One M8 really is, we've put it head to head with one of its main rivals, the iPhone 5S. Also, make sure you check out our HTC One M8 review. The HTC One M8, just as its predecessor before it, is a beautifully crafted device, With its aluminium unibody build, precise edges and machined finish, it is probably the only device that can match Apple and the iPhone 5S when it comes to industrial design. HTC's newly announced M8 sticks pretty close to the design of the One, with only a few well chosen changes. The aluminium design is now even more machined than before, giving it a better feel in the hand and it's ever so slightly more curved. There's now a slot for a micro SD card, something which the iPhone doesn't have and the headphone jack has been switched to the bottom. Both these devices feel really premium in the hand and that's no doubt down to high-end materials used in the construction. Thanks to the curved back of the One M8 it nestles nicely in your palm, though due to the 5-inch screen it is much bigger than the 4-inch display boasting iPhone. Size-wise the iPhone is thinner, lighter and smaller coming in at 123.8 mm x 58.6 mm x 7.6 mm and 112g, though the M8 is definitely no porker, coming in at 160g and 9.3mm thin. While the weights do seem a bit apart, holding both in your hands it's hard to really distinguish a difference between the two. Both the iPhone 5s and the HTC One M8 offer different specs when it comes to the display, with HTC choosing to kit its newest offering out with a Full-HD 1080p, 5-inch display. Both these flagship devices come packing some serious power with the latest chipsets and internals. HTC has fitted the One M8 out with Qualcomm's latest Snapdragon processor, the 801, which is clocked at 2.3 GHz and is paired with 2GB RAM. Apple's iPhone 5S features Cupertino's latest A7 chip and 1GB of RAM. Even though there is a 1GB difference in RAM, we've always found the iPhone 5S to be a speedy performer, with very little lag. Interestingly the iPhone has a 64-bit architecture, whereas the HTC One M8, like all other Android devices, is still at 32-bit. While this won't cause any day to day issues, it does raise some questions about future support once 64-bit processors are common place amongst Android devices. The Ultrapixel camera from the 2013 HTC One model is still here, with the same four ultrapixel sensor, but it has now been joined by a second lens, placed above the main snapper. This clever extra sensor lets you add depth to your shots, including the ability to refocus the image after you've taken it. You can also add a parallax effect to your photos, giving further depth. Apple did a similar thing for the homescreen on iOS7. HTC has kitted the M8 with a whole host of nifty camera software tweaks, like a special selfie mode which takes advantage of the front facing 5-meg camera. Apple's iPhone 5s, which packs an 8-meg sensor, also has some tricks tucked away in its camera bag, including a True Tone flash for realistic skin tones in darker environments, a Sapphire crystal lens cover, ƒ/2.2 aperture and a backside illuminated sensor. It can also shoot slow-motion video, if you fancy getting a bit creative. We already know that the camera on the iPhone 5s takes some fantastic snaps and from our initial hand-on with HTC One M8, it also hasn't skimped in the imaging department. Can the HTC One M8 top our best Android phone 2014 list? Unlike the Samsung Galaxy S5, which boasts a vast array of features and software additions, both the HTC One M8 and iPhone 5S try to keep to keep things much more simple. It is hard to compare the two devices in terms of software as they are both so very different. The iPhone runs iOS7, while HTC's One M8 is powered by Android 4.4 Kit Kat with the Sense 6.0 overlay. This UI remains pretty much the same as last year, though there have been some slight tweaks, with Blinkfeed becoming much more customisable and a number of gestures being introduced to the interface. Beats Audio is no longer around, but the fantastic BoomSound front facing speakers gladly are, providing punchy audio and thanks to a new internal digital signal processing chip, you'll now get a wider frequency of sound. While the iPhone's M7 chip lets you track your movements, similar to a dedicated fitness tracker, the HTC One M8 comes pre-installed with a special version of the Fitbit app, that works without an added accessory. The HTC One M8 comes fitted with a 2600mAH battery battery, which should be good for a day's data and talk – pretty normal for a phone these days. On average this is about how much juice we can get out of an iPhone 5s. We'll have to put the M8 through it paces more thoroughly, though you'll most likely still have to plug it every night to charge. The HTC One M8 though supports fifth generation WiFi 802.11ac, while the iPhone is still stuck using the slightly older 802.11a/b/g/n bands. So, theoretically you'll get you should quicker speeds when connected to a compatible router.